I am working on a verrrrry long China post (hopefully will be posted tomorrow morning), so this is going to be short and simple! Much like the preparation of this meal. 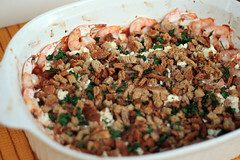 The most time consuming part of this dish was removing the shells and de-veining the shrimp. Luckily you can purchase raw shrimp without the shell. I forgot that half of the shrimp in my freezer had the shell/vein so when it came time to prepare the meal I was happy to have my mom there to help me get through it quickly. As a side note, I can appreciate the tail on for the appearance of the dish, but when it comes to eating I think it would be more pleasant to have the tails removed. It’s really up to you and the dish will turn out great either way. I think this shrimp would go wonderfully with a simple side of pasta in garlic butter, with rice, or, as I served it, with a nice crusty bread brushed with garlic butter. I liked to use the bread to sop up the extra sauce. Add a green salad or green beans and you have a well rounded meal that will be well received by guests, but also simple enough for week night. In a large skillet over medium heat, heat 2 tablespoons of the oil . Then add the onion and cook until translucent and soft, about 5 minutes, then add the garlic and cook for 1 minute. Add the wine to the pan and use a wooden spoon to scrape up any brown bits stuck to the pan. Cook for 2-3 minutes, or until the liquid has reduced by half. Reduce the heat to low. Stir in the tomatoes with the liquid, tomato paste, oregano, salt and pepper and simmer for 10-15 minutes. In a small bowl, toss together the bread crumbs, parsley, and the remaining tablespoon olive oil. Carefully pour the tomato sauce into a medium size casserole dish, then lay the shrimp in a single layer on top of the the tomato mixture. 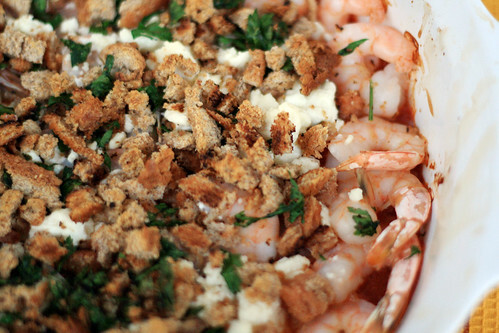 Sprinkle the feta cheese then the bread crumbs over top of the shrimp. 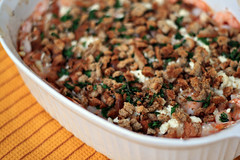 Bake for 15 minutes until the shrimp is pink and the bread crumbs have started to brown. Squeeze the fresh lemon juice over top and serve immediately.